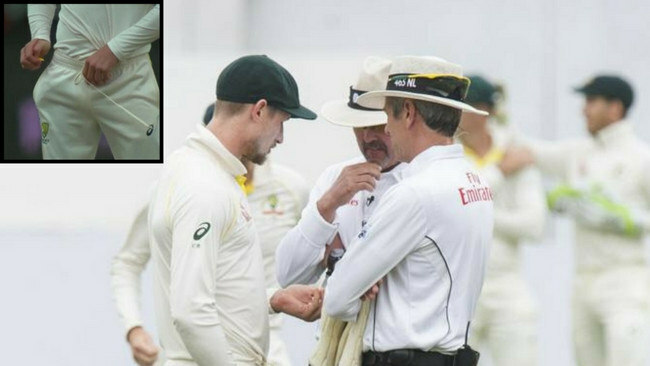 Umpires confront Cameron Bancroft over his use of a sticking plaster (inset) to ball tamper. THE cricket community has reacted with shock and outrage to revelations of Australia's premeditated attempt to cheat in the third Test against South Africa. Steve Smith, who has made it clear he doesn't intend to stand down as skipper over the ball-tampering furore, and his leadership group discussed the merits of using sticky tape to illegally alter the ball at lunch on day three of the contest in Cape Town. Cameron Bancroft was then caught using the tape, which had debris from the pitch, while working on the ball. Michael Clarke was among the millions of Australians waking up on Sunday to headlines and news bulletins they could scarcely believable. "WHAT THE ........ HAVE I JUST WOKEN UP TO. Please tell me this is a bad dream," Clarke posted on Twitter. There isn't exactly a good time for such an incident to unfold but it could hardly have been timed more poorly for Smith's side and Cricket Australia. On the field, the series was locked 1-1 and the team's desperation to win has overridden their moral compasses. Off the field, CA has been trying to improve the image of its side while lodging an official complaint about the vile nature of abuse from South African spectators. "The Australian camp has been lecturing people lately on how the game should be played and a line that shouldn't be crossed," former England captain Nasser Hussain told Sky Sports "Some of the stuff that has come out of the Australian camp, especially, has been laughable. "Well, it looks like they're on the wrong side of the line here. "It does not look good for the image of the game. Injured Proteas paceman Dale Steyn and recently-retired batsman Kevin Pietersen questioned whether coach Darren Lehmann was aware of Australia's plan, something Smith denied while speaking to reporters. "This will be Darren Lehmann's greatest test as a coach, cos (sic) I will struggle to believe that this was all Bancroft's idea," Pietersen posted on Twitter.